The Iowa Dairy Goat Association Spring Classic is a 4-ring doe and 4-ring buck show held at the Jasper County Fairgrounds in Colfax, IA. The 2017 show will start at 8 AM Saturday morning with senior does. Showmanship will follow the senior doe show and will be followed by the junior doe show. All four buck rings will follow the junior doe show. The Sunday morning show will start at 8 AM with senior does followed by junior does. Don’t miss the educational Youth Showmanship round. 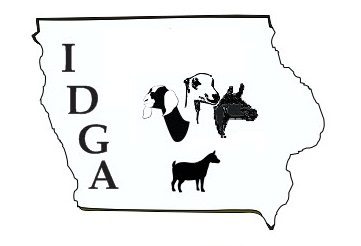 The IDGA Spring Classic is dual sanctioned by the American Dairy Goat Association (ADGA) and, for Nigerian Dwarfs, the American Goat Society (AGS). The Iowa Spring Classic Raffle will be open all day Saturday with many items and even a special children’s table. IDGA provides Friday and Saturday evening dinners for exhibitors, and a local church group will have breakfast and lunch for purchase. The Iowa Dairy Goat Association Spring Classic show committee is dedicated to offering a top-quality and smoothly run show.